Among the signatories are Maksym Polyakov and Yevhen Deydey, indicted of illegal enrichment. 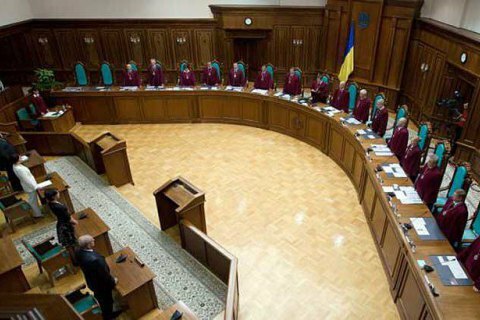 Fifty nine Ukrainian people's deputies asked the Constitutional Court to recognize the article of the Criminal Code setting criminal liability for illegal enrichment as unconstitutional. MP Pavlo Pynzenyk (People's Front) will represent the group of initiators. People's Front MPs Maksym Polyakov and Yevhen Deydey, who are probed on illegal enrichment and receiving undue benefits charges are among the initiators the complaint. The initiators ask the Constitutional Court promptly (within a month) to consider the complaint and recognize Art. 368-2 of the Criminal Code (illegal enrichment) unconstitutional. The Article 368-2 of the Criminal Code of Ukraine provides for criminal liability for illegal enrichment. It has been incorporated into the Criminal Code in 2011.